The journey through Mexico goes in many different directions, far from a straight line. I’m taking a few busses, simply because I would turn old before I reach Patagonia if I would cycle every detour. In Chiapas however, the main reason I choose the bus is for safety reasons. Two foreign cyclists got murdered a few weeks ago in this region of Chiapas and there has been more reports of incidents in the past year, like road blocks and kidnappings. Not only to foreigners, also to Mexican people. The fact that Central America isn’t the safest zone was something I knew, but recent events are scaring me off to much. From San Cristobal De Las Casas I take a bus to Palenque. It takes an 8 hour detour because currently even busses avoid the notorious highway through the mountains. Palenque is known for its Maya ruins which I visit in the early morning, before it gets really hot. It's a beautiful walk. 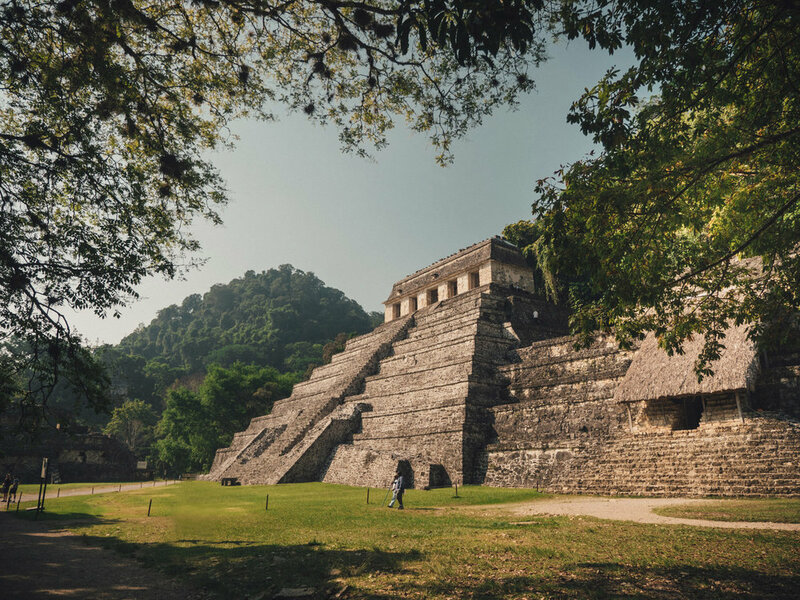 The park is well maintained and you are free to climb the temples, other than the more famous ruins as Chichen Itza in Yucatan. I sit in the shade on top of one of the temples. It's a peaceful, quiet place. The next morning I'm on the bike and I get sick. After the long bus ride from San Cristobal de Las Casas to Palenque, I though I would be ready to cycle again. My legs had to recover from the long walk to Arco del Tiempo a few days ago. Cycling doesn’t built the muscles you use when walking, it appears. The road ahead is mainly flat, my upper legs feel better now, after two days off. I rode from Palenque, 55 km. It was extremely hot. I didn’t feel strong. I took breaks at a few small shops where I drank two soft drinks. In this heat it’s the only thing I crave. A cold, sugary drink. I’m gasping for air sitting in the shade on a plastic chair. It’s not a fancy place. In these regions of remote Mexico you only find very basic little shops. No wifi or anything, not that I need that now. At the end of the cycling day I feel my body lacks a lot of energy. I’m wondering what it is. Still the muscle pain from the hike a few days back? Not enough food, or not the right nutrition? Or is simply the heat? The humid climate which is so different from where I grew up. Even the hottest day of summer in the Netherlands doesn't compare to this. And here it’s everyday like this. It feels unhealthy. My skin spits out sweat, while locals are barely breaking any sweat. I’m not enjoying the cycling at all. I do enjoy the travelling, the sights, the places I’ve visited, the food, I like it all. But the cycling is too much at the moment, it’s simply no fun. I reach a little town where I check in to a hotel. I don’t feel well. My head is burned a bit and I’ve got a headache. I feel a high pressure. In the middle of the night I wake up and have to go the toilet urgently. Food poisoning. I can’t eat anything an I feel weak. When I look at the map it's only flat straight roads towards Tulum, my next destination. It sounds attractive, but it’s in 35-40ºC temperatures. Before I can cycle, I first need to get stronger. But I’m not going to stay in this hotel where there’s nothing to do so I cycle to the busstation. 3 hours later goes a bus. I inflate my mattras and pillow in the station and take a nap on the floor next to my bike. Ticket vendors are shouting destinations. It annoys me, but through the noise I fall in a light sleep. In 4 hours I'm in Tulum on the seaside, where I can take the time to recover.